Whether your belly skin has become loose due to childbirth or rapid weight loss, you also need to know that sagging skin does not go away on its way. In some cases, surgery may be the only answer, but for most cases, there are natural ways to tighten your belly skin. Elasticity reacts differently at different stages in life and ages. For the young people, tightening their belly skin may only take them a bit of effort. For the 50-year-old people, this process may take a bit longer for their belly skin to tighten up and perhaps, it may not get back to its size due to age. In this article, I will reveal some of the best tips on how to tighten belly skin after weight loss. To get more information about effective tips for health problems, go to our main How to page and then try to follow one or more of these tips for good. Unlike skin on other parts of the body like hands, face and legs, a variety of people skip out their belly skin. For instance, you often wear sunscreen on your leg, face, hands, but not apply on your belly skin. In case you go out regularly, you should wear sunscreen on your belly skin to protect the skin elasticity and limit sunbathing, which can dry out and damage the skin quickly. Ensure that taking a shower and moisturizing the belly skin after sunbathing and swimming. When you are out in the sun, it is advised to protect the belly skin by wearing long shirts, dresses and even have covering clothes if required. One of the best tips on how to tighten belly skin after weight loss is to add zinc to diet. This way can help you treat stretch marks, build your new skin cells and tighten your skin. You can take in zinc from foods such as pumpkin seeds, peanuts, wheat germ, sesame, oysters, etc. Adding more zinc-rich foods to your diet is safe and easy to do at home. Collagen is a kind of protein and its main function is to connect body cells together. One of the main reasons of loose skin or tight skin is the change in collagen property. Collagen has the work of connection and the function of creating skin elasticity. Your loose skin is mainly due to the deficiency of collagen after giving birth. Therefore, you should add more collagen to your diet to improve your belly skin elasticity. 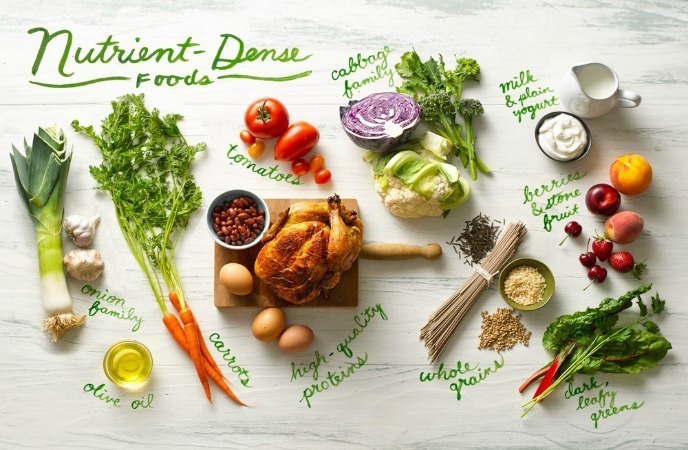 There are many foods that can offer you more collagen such as soy products like soy milk and tofu, vitamin C-rich foods like spinach, asparagus, carrots and tomatoes as well as omega-3 rich foods like tuna and salmon. Protein is a good source that will help with your muscle growth. Besides, protein also has important nutrients that help tighten your skin. Your protein consumption depends on your weight as well as the physical activity you perform. On an average, people should take in about 50g of protein. 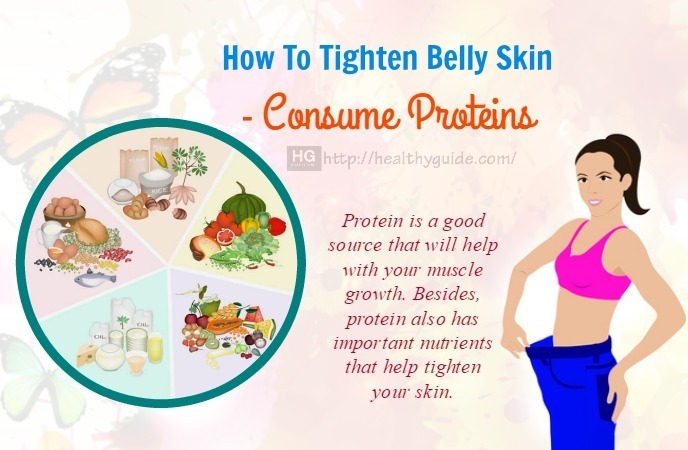 This is actually one on the list of best tips on how to tighten belly skin after weight loss that you should consider consuming more proteins in your diet for good. You need to keep cleaning in all parts of the body including your belly skin. Taking bath regularly will be one of the best ways on how to tighten belly skin fast and other parts of the body. While bathing, you can use your fingers to gently massage, strongly press on the skin to stimulate circulation to improve skin elasticity. Remember that losing your weight too quickly may be a reason for your loose belly skin. Actually, your belly skin needs to have some time to recover after weight loss. As a result, you should reduce weight gradually. However, many people follow super-fast weight loss that will be dangerous to the health and harmful to the skin and beauty. Instead, follow natural weight loss program and just lose small weight at a time. Taking bath with hot water is a bad habit you should give up since hot water will make the skin become drier. Instead, take a warm bath in order to moisturize the skin. 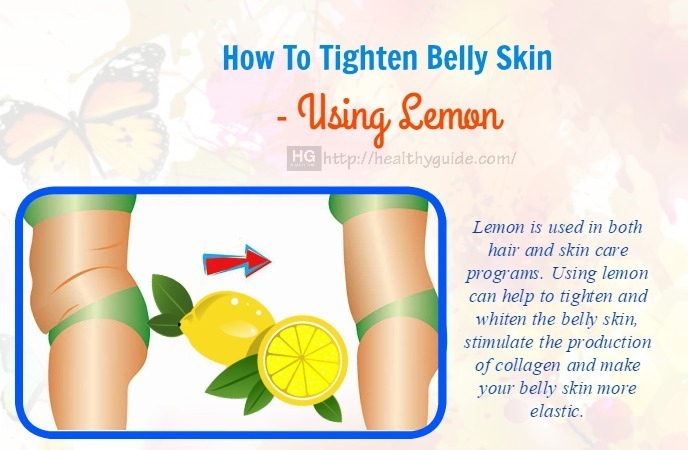 This tip is very important if you are trying to know how to tighten belly skin. 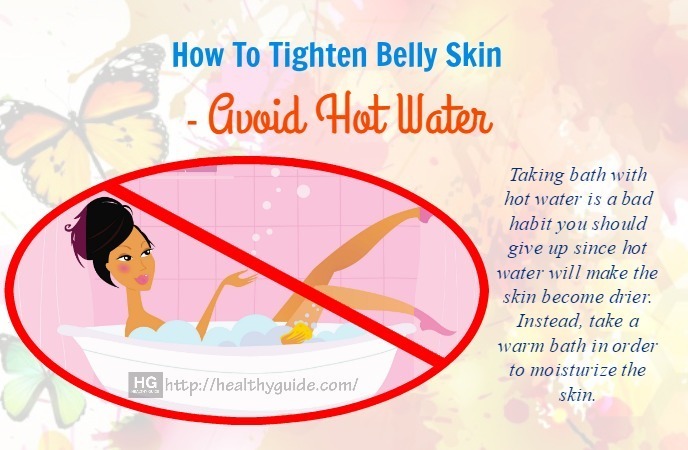 So, try to avoid hot water if you want to know how to tighten belly skin after weight loss. When you notice that your belly skin is dry and loose, you should avoid using harsh soaps to wash every day. The reason for this is that they contain sulfate, which can dry out or dehydrate your skin making the skin looser. Therefore, keep your skin hydrated at all times and you do not anything that may dry out your belly skin. Experts suggest that you should use soaps that are made from natural herbs to cleanse and bath your belly skin. In fact, avoiding harsh soaps is another tip on how to tighten belly skin after weight loss that you should know and try to follow as soon as possible if you want to tighten your belly skin naturally. Another good tip on how to tighten belly skin after delivery is to exfoliate. You should consider scrubbing and exfoliating your belly skin about 2-3 times a week because it can help you remove dead skin cells from the tummy’s surface and stimulate the skin to form the new skin cells faster. Make sure to moisturize after exfoliating your belly skin so that you do not make your belly skin dry and make it sore. Salt is one of the most effective ingredients for the skin care. In this post, I will reveal a simple way on how to tighten belly skin fast by using sea salt. This will improve the blood circulation to the belly area and it will also supply a great source of healthy minerals. You put it into a clean washcloth and place on your belly skin when the salt is hot. You compress it until you see the salt cools down. For the best results, you should massage your belly skin. Repeat this method twice a week. You need to prepare 1kg of ginger and 1l of wine. Wash ginger and still keep the skin of ginger. Then, blend it smooth. You mix ginger and wine in a bottle for about 2-3 months. You use this mixture to massage in order to massage the belly skin regularly. Wash ginger and still keep the skinof ginger. Blend ginger until you get a smooth paste and then roast this ginger with salt. Then, you place this mixture in a bag and then compress it on your belly skin until it is cool. Massage your belly skin with lemon juice in clockwise direction. Repeat this method 3 times a week. 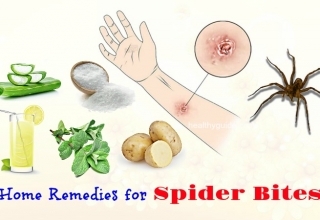 Cut some lemons into small slices and then place them over your abdomen for half an hour. Then, you wash it off. Drink fresh lemon juice every day in order to reduce belly fat and make your skin brighter. There are a plenty of other natural tips on how to tighten belly skin naturally in this article, continue reading this article to learn more. One of great tips on how to tighten belly skin after delivery is to use egg whites. This is because they are packed with protein as well as other nutrients that may help you rejuvenate your belly skin and make it firmer. Use the whites of 2 eggs, apply it on your belly and then leave it until they have dried out before rinsing off with warm water. After that, you will feel that the egg whites can tighten your belly skin when they are dry and this will leave your belly skin smoother and softer. It is one of the best tips on how to tighten belly skin after delivery, so you should try to use egg whites if you want to tighten your sagging belly skin naturally. Coconut oil is a good source to repair damaged elasticity and collagen. However, when you use coconut oil or other natural home remedies for tightened belly skin, you also need to be patient. You just need to apply coconut oil on your belly skin and gently massage it. Your belly skin will become more beautiful in case you perform it regularly. Coconut oil can help you moisturize your belly skin and simultaneously increase the connection of skin cells, making this skin area brighter, naturally tighter and safe. With this natural remedy, you will need some time before you can see results, but be patient and you will notice an improvement in the end. So, try to use coconut oil in your skincare regime when you are trying to tighten your sagging belly skin at home. Another one out of the best tips on how to tighten belly skin after delivery that you should not skip out must include using rose water. Rose water is known as an astringent, so it can help you tighten up, close the skin pores and tone your belly skin at home. For a good skin-tightening toner, you can consider mixing a cup of rose water and 1 tsp. 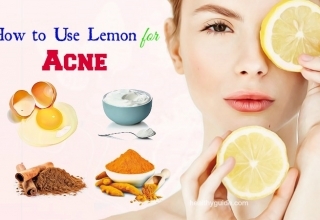 of lemon juice and 5 drops of almond oil. 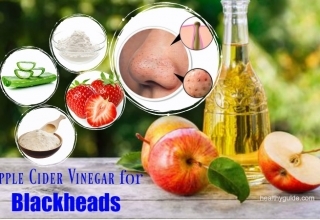 You massage this mixture into your belly area daily and you should start following this home remedy soon to notice an improvement in your loose belly skin. 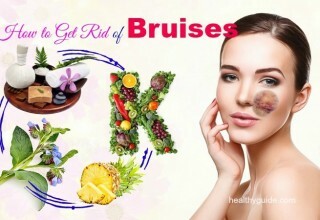 Foods that are rich in nutrients will help you decrease loose skin and improve skin elasticity. You should add citrus fruits, strawberries and vegetables like bell peppers to your diet regularly to help collagen formation that is a vital part in tightening up the belly skin. Besides, healthy fats can help in forming collagen and increasing the moisture of the skin to prevent a dry and stretched look. Simply, add foods such as seeds, nuts, avocado, olive oil and omega-3 rich salmon to daily diet in moderation. This is another one on the list of tips on how to tighten belly skin fast that you should know when you are trying to tighten your sagging belly skin. When it comes to knowing how to tighten belly skin after delivery, you should follow a high-quality diet, which includes essential amino acids, omega-fatty acids and proteins for the rejuvenation of the skin or the remodeling of the skin. Also, you should increase your consumption of fresh fruits and vegetables to provide minerals, vitamins and antioxidants for healthy-looking, younger and bright skin. 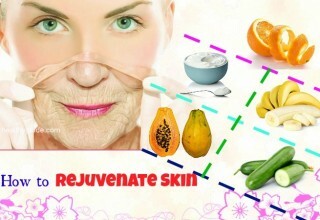 You should eat raw foods such as fruits and vegetables that are good for your skin health. Try making vegetable and fruit smoothies for breakfast daily. Besides, you can try consuming juices that is a good solution to get a serving of produce. Smoking is considered as one of the main factors, which affects the development of the skin cells. In addition to this, it can delay the collagen production. Therefore, you should stop smoking as soon as possible in order to improve the general physical health and prevent you from developing neoplastic, medical and metabolic disorders. 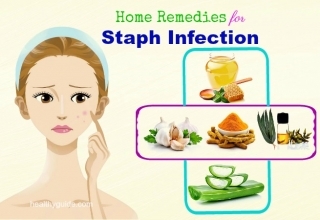 Besides, you can get your youthful skin back without applying any cosmetic products. This is another good tip on how to tighten belly skin after delivery. You should try adding resistance training to your workout regimen to increase the lean muscle mass and prevent wasting. Some belly toning exercises that you can consider adding to your workout 3 times a week are crunches, pelvic thrusts and sit-ups. Once muscle mass is increased, your body will be able to be tightened and this will help you create a flabby tummy. 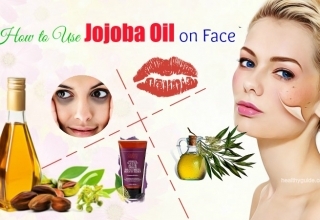 Mustard oil massage: This oil may help to develop muscles, tighten the loose skin and offer you a glowing skin. Almond oil massage: This oil contains a high content of vitamin E to nourish the skin and antioxidants to protect against aging; therefore, massaging with almond oil can help you treat sagging belly skin. 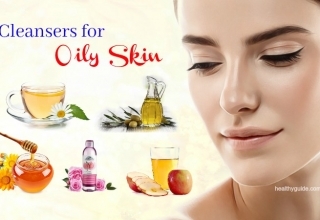 Essential oil massage such as olive oil, coconut oil, etc: These essential oils may help you improve the blood circulation in the bell, y area, resulting in tissues and muscles underneath the belly skin can be tightened. In order to tighten the belly skin, you should consider drinking 8 glasses of cold water every day. In fact, water will help you remove the toxins from the body and supply the moisture to keep the skin fresh and supple. Additionally, you can consider drinking herbal tea and coconut water to help you stay hydrated. Nonetheless, you should avoid consuming excess coffee and alcohol because these drinks can dehydrate you over time. Staying hydrated on the inside is very important. If you get dehydrated, this will show on your belly skin soon and it will just make loose and sagging skin look worse. Keep reading this article to discover other tips on how to tighten belly skin after delivery and then try to follow them for good! One of the best tips on how to tighten belly skin must include using baby oil. After you take a shower, you should apply a layer of baby oil in order to help you keep the moisture on your belly skin that may improve its elasticity. Alternatively, you can consider adding some drops of baby oil into the bathing water. The skin can get infused with this oil when you relax. Using a moisturizer that contains vitamin E can help your skin stay moist, making new skin cells grow faster. 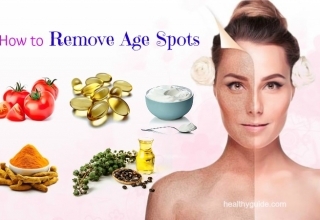 Besides, moisturizing can help to minimize wrinkles. There is a variety of creams and lotions in the market that you can choose from. Remember to apply these lotions and creams on your loose skin because they can help with the process of tightening skin after pregnancy. Also, you can massage with these lotions and creams to improve the blood circulation. Follow it at least twice a day to get the best results. Another one on the list of best tips on how to tighten belly skin that you should know must include keeping a healthy mind. When you cannot lose any extra flab, you also need to keep a healthy mind. Try to keep yourself relaxed. You can listen to music, practice deep breathing and enjoy outdoor activities as much as possible. Visualization is an interesting tool you can use to make your desire come true. Even some professional athletes also use this tool to help improve their performances. The simple way is that when you mentally see something, you will have more stimulation to take actions toward making what you desire come true. Therefore, when you see a tight belly skin, you tend to do more things like eat healthy, exercise and follow other helpful tips. You take some time daily and visualize yourself with tightened belly skin. When getting rid of loose belly skin, it is very important to be patient because your body will need time to adapt to your new size. Besides, you also need to remember that tightening belly skin may take you time, so be patient and follow these tips gradually. If you have lost some weight, now you may be concerned about your loose belly skin. Fortunately, some people who have gone before you have done all methods to tighten their belly skin and they pass these methods on. Remember that these methods work for these people, but they may not work for your case. You can try some various methods to tighten your belly skin and see which method is helpful for your condition. After reading the article of 28 tips on how to tighten belly skin after delivery, hope that this article will help the readers of Healthy Guide a lot in finding out the most effective solution for their belly skin. If you know other tips on how to tighten belly skin at home, please leave them in the comment section below.